It was April of 2009, while competing at Ironman 70.3 Oceanside, that my husband and I realized we were meant to have an Amico in our lives. Post-race we were hanging out at one of our favorite pizza and beer joints, Pizza Port, in Solana Beach. We found ourselves sitting on the front patio beside this 3 legged Australian Cattle dog. Something about this little guy spoke to us; he told us (in his doggie language) that this was the kind of pup we wanted. Amico became part of the Williamson family a few weeks later in the spring of 2009, as we adopted him from Texas Cattle Dog Rescue. We drove down to Brenham, Texas, met his foster mom at a Dairy Queen, and brought him back to Austin. From the minute he saw us, you would think he’d known us forever. He jumped out of her truck right into our car, a little scrappy, a bit stinky, but immediately sweet; tongue-out, smiling, tail wagging. His name came from our favorite pizza and beer place (yes, there is a theme here) in Salida, Colorado; Amica’s, which we added a little masculinity to. 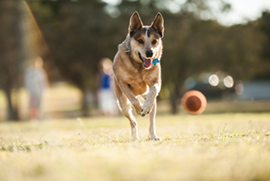 Cattle dogs are fairly high energy; they need a good amount of exercise. Once worn out, they’re pretty expert at curling up on the couch by your side. They’re always watching you and often called ‘velcro’ as they’re known to attach to one of their owners. While many of my runs are specific workouts and need to be done solo, it’s always a treat to head out to the trails with Derick and Amico for easy or long runs. The temps need to be cooler for the pup, and ideally there is a river or a creek along the way for him to cool off; he loves to swim about as much as his mom. If we can’t work a run in with him, our routine is an evening Chuck-It play. I have to admit, I probably look forward to this as much as he does. While I spend the day wearing myself out going from one workout to the next, once the sun begins to set, it’s his time to play and mine to chill out. We scout out a nice large field, protected from the roads, where we can toss the ball and he can return it to us until he’s worn out and tells us he’s ready to go back home. Much like me, if he doesn’t get in his daily movement and activity, he’s known to be a bit of a cranky, moody little guy. I’ve always had a thing for 5k races. I often look towards my ‘5k Off-Season’ with anticipation. It’s the time of the year to dial back your training, but not completely become a couch potato. Three miles is the perfect distance to allow you to push yourself, and keep you fit, but prevent you from over-doing it. Triathlon goals aside, I have an inner desire to, one day, bust out a crazy fast 5k race; maybe under 16 minutes. Or perhaps I should just start by making a goal to run as fast as our dog Amico, seeing that he currently holds the 2nd fastest 5k in the household only to my husband Derick, a natural-born runner. And he made it look so easy; I mean check out the picture. He’s in full stride and I’m fairly certain he’s smiling. 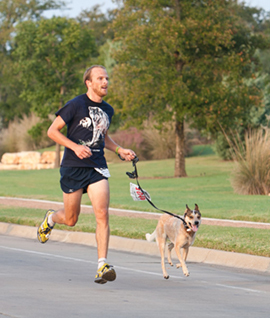 Sure Derick’s wolf shirt may have given him some extra confidence, but he ran his PR in his first 5k attempt ever. Truly makes his mama a little jealous, but of course at the same time, quite proud. Recently, Derick and I made the choice to move back to Colorado, leaving Amico’s homeland; yet he has adjusted quite well. He’s been a part-time mountain dog since we got him, as we have made regular trips out to the mountains every summer. Thankfully he loves to ride in the car. Actually he likes it so much that if we start to pack the car, he’ll hop in and not get out. I believe it’s his way of saying “If you’re going somewhere, you aren’t leaving me behind.” And additionally, he may love the snow as much as he does the water. He actually came along with us our first week out here, when we skinned up Mount Baldy up to 12,000 ft and skied down! The uphill was a little tough for him (as it was for me), but he hauled downhill. Skiing is a ton of fun and something Derick and I love to do together (our honeymoon was a ski trip), but it’s amazing how much more fun it is when you can watch your pup hopping through the snow by your side. It seems his metabolism has gone up since living at altitude; hence, he gets to eat a bit more Nulo each day. Lucky dog! We have often times tried to deny that Amico is aging. No pet owner wants this; much like cartoon characters, we all want to think time will stand still and our furry creatures will be with us forever, never aging. While it’s unlikely he could match his 16:19-5k these days, his energy, spirit and smile are just as endearing and bring us just as much joy as the day we got him. And maybe one of these days, if I work really hard, I’ll be able to run as fast as Amico. Jonathan and Zoe will be the first to cheer you on and the last ones out on the course helping you finish. They are a simple pet and pet parent, yet they are so much more than that – they are the epitome of loyalty, inspiration, and possibility. Looking a companion on your routine runs? Dogs can make the perfect partner — if well prepared. Learn tips to ensure they stay safe and well-fueled.